After 50+ hours, I have finally finished Nier: Automata and have seen all of the true endings in the game. This is one of those games that when you finish it, you immediately go to Reddit, Facebook, Youtube, anywhere you can to have an official discussion about the game with other people who have finished it as well, because you just need to talk about it. From start to finish, Nier: Automata is an incredible experience. It's a fun and fast paced action game with a great story and fantastic characters as well. It's also one of the more deep and thought provoking stories I have ever experienced from a videogame. 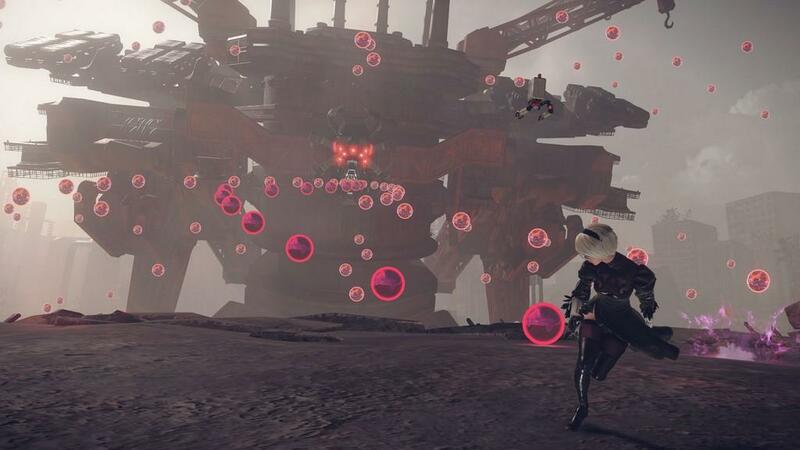 Nier: Automata takes place thousands of years into the future, where humans have left Earth thanks to aliens. 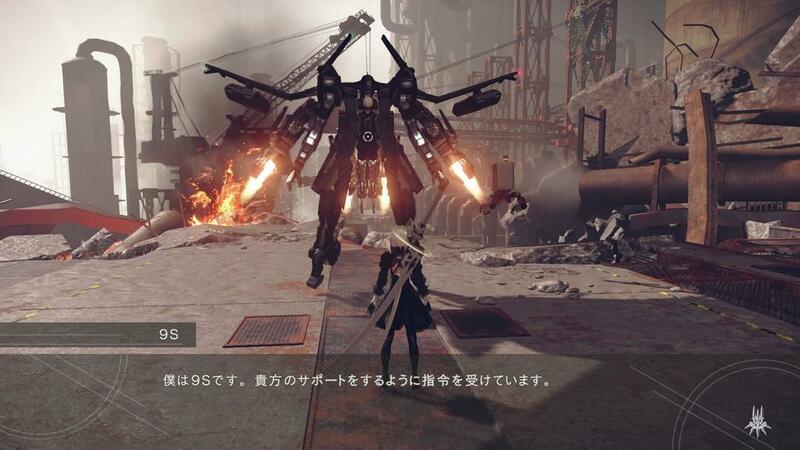 Humans created androids called the Yorha to fight on their behalf and the aliens created machines to fight on their behalf, so there is an ongoing and massive war on a post apocalyptic Earth for the fate of mankind. Enter 2B, a Yorha android and her support android 9S. 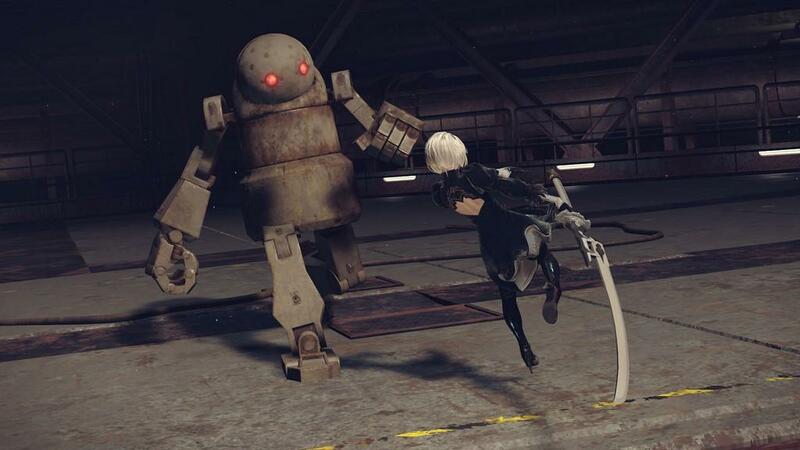 Most of the beginning of the game will have you doing simple tasks to help out the human resistance forces, but it's the dynamic and banter between 2B and 9S that really shines in the slower early parts of the game. 2B is extremely cold and uncaring at the very beginning of the game, and why wouldn't she, she's an android after all. 9S on the other hand I guess you could say is more human, and talks about how all of his friends call him "nines". 2B and 9S's banter is also where you will get most of the story in the beginning of the game, so I would often try to find new places and complete missions just to hear their interactions with each other. This is also the point in the game where the world opens up and you are free to roam around on your own and complete side missions if you wish. There are a plethora of side missions to complete and will reward you with XP, cash and materials you can use to upgrade weapons or 2B herself. 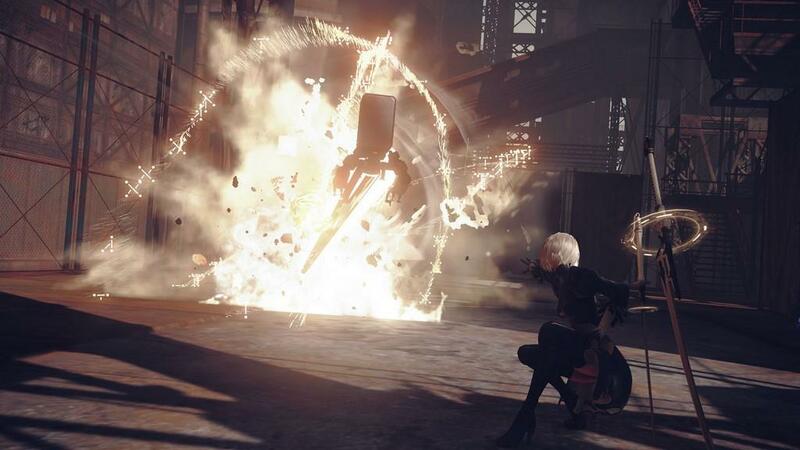 Combat in Nier: Automata is fast, stylish and fun. If you played games like Bayonetta 2 or Metal Gear Revengeance, you have a good idea of what to expect here. 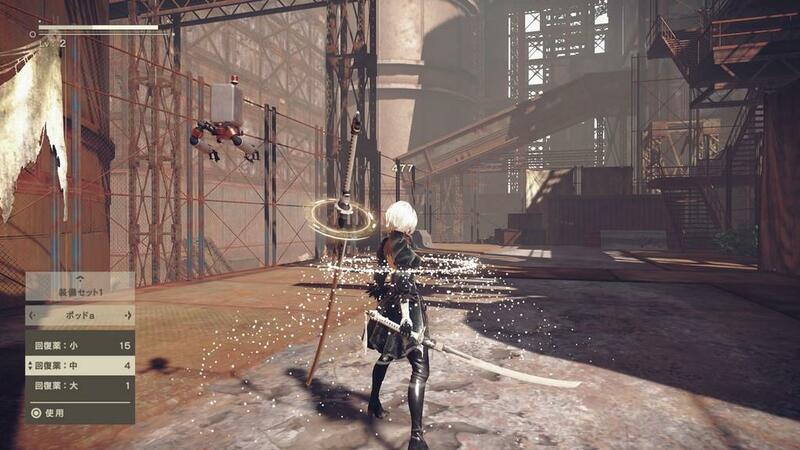 2B has a light attack and a heavy attack and you can alternate attacks to create. 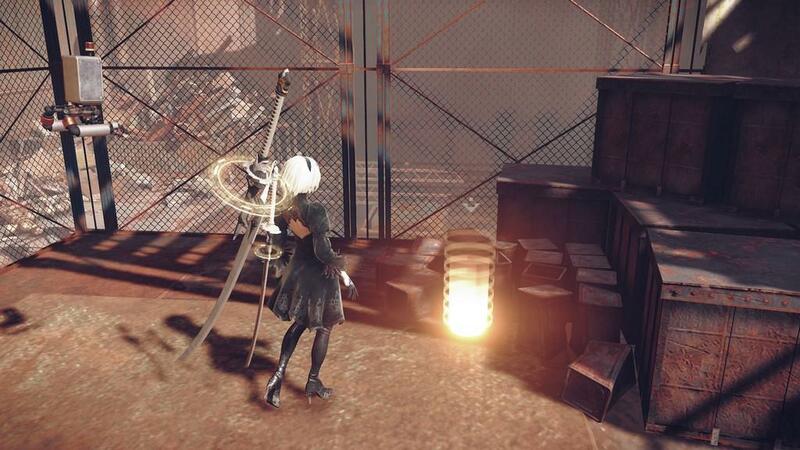 2B also has her trusty pod at her side which can fire a machine gun and has one additional attack. For instance, once of the pods attacks sends out a huge beam of energy that does massive damage to anything in it's path. 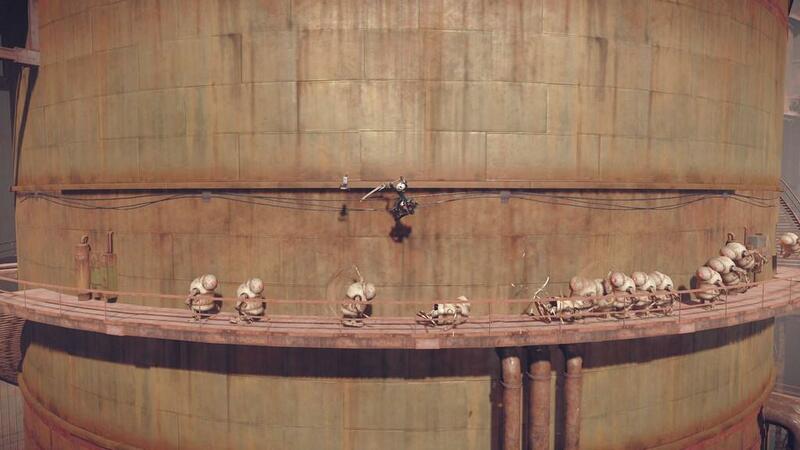 Or if you want more defense, the pod can create a barrier around you to protect you during fights. Finally, 2B also has a self destruct attack. This attack however should only be used as a last resort if you are swarmed by enemies. Self destructing will pretty much kill any machine around you, sans the bigger ones, but there is a catch. Self destructing will knock 2B's health all the way down to 1HP and she will be unable to attack or move quickly for a good 5-10 seconds afterwards. The other thing that Nier: Automata does well is how it combines about five different genres of games into one. 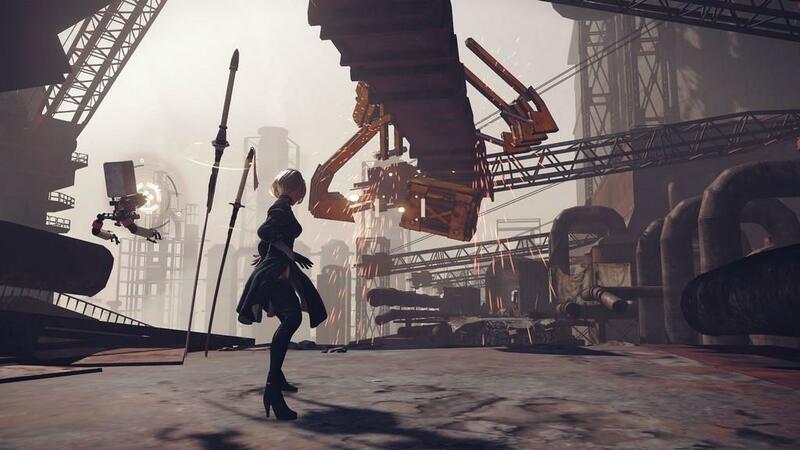 Nier: Automata will go from a top down space shooter, to a twin stick shooter, to a third person hack and slash, to a 2D platformer and then to another twin stick shooter all within seconds, and all of these parts of the game are perfectly done. There was never a time when the game would suddenly switch and I would roll my eyes because the new segments weren't fun. Even at one point in the story when the game will constantly swap back and forth between playable protagonists every 10 seconds or so, the game blends these moments together perfectly and in a way where the action never lets up and never stops being fun. In fact, it builds the tension for these fights perfectly. 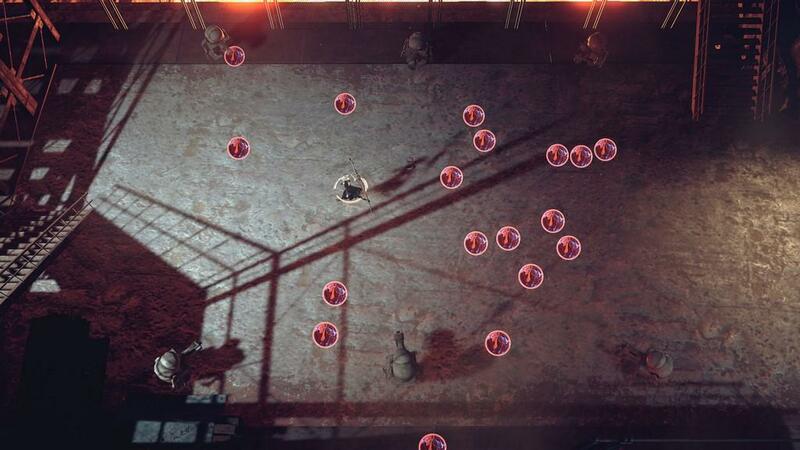 Enemies will level up as you do so the game is a constant challenge and never feels like you need to grind out one area because you aren't strong enough to defeat certain enemies. Speaking of enemies, the boss battles in this game are fantastic. Bosses are huge, challenging and take a while to defeat, but once you do take down a boss, it's a very rewarding feeling. One of the coolest things in Nier: Automata is how much attention to detail they put into the fact that you are an android. For instance everything on the HUD and even the pause menu is like you are looking at it through the eyes of an android. 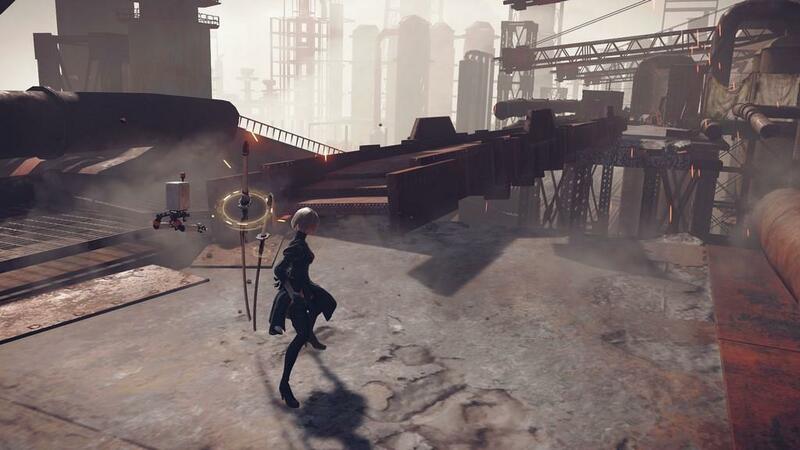 When 2B is low on health, every screen in the game will start bugging out like if you bumped an NES and the game started glitching out. But, one of the coolest is the chip system. Since these are androids, they can be upgraded with chip programs, which you can buy at vendors around the map. The chip program allows you to add modules to 2B to give her additional health, increased damage, increased speed, and a plethora of other things like being able to regain health slowly when out of battle. Each chip however does cost a certain amount of space, and like filling up a hard drive, you can only have so many chips installed at one time. The HUD is part of the chip program as well. Don't like whats on the HUD? Low on chip space? Each part of the HUD including health, the map, XP gained, enemy damage, etc are their own separate chips which you can remove at any time. Oh, and if you want to get one of the silly endings, remove 2B's operating system chip. There are a ton of endings in Nier: Automata, one for each letter of the alphabet, except that only the fist five (A-E) are true endings. All of the other ones are silly endings you get for abandoning your mission or by . For instance, the game tells you that if you remove the operating system chip from your android, it will result in death. Well go ahead and remove it and see what happens. The true endings on the other hand can seem kind of deceptive at first. When I first "finished" the game and got my first ending, it took be around 10 hours and that included doing some side quests as well. After the credits sequence however, you get a message from Square Enix thanking you for playing the game and to "enjoy the rest of the game". A misconception that I am seeing around the internet is that you need to play through the game five times in order to get all the true endings. That's just not true. The only time you will need to replay the game again is to get the second ending. On your first playthrough, you play as 2B and on your second playthough, which is the same story again, you will play as 9S. Even though you are playing through the same game again, they generously switch things up for you as you will be playing the story again but from the perspective of 9S. 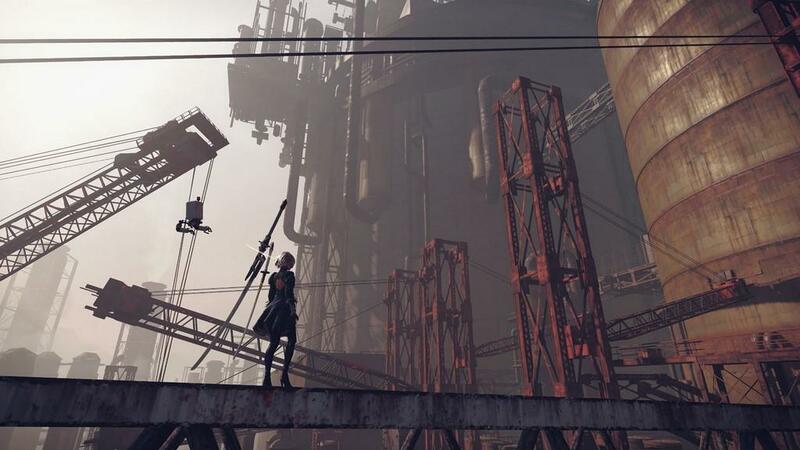 This means that all the times during your first playthrough when 9S disappeared, you will get to play those moments and get more information about the bigger picture. 9S also plays differently from 2B. 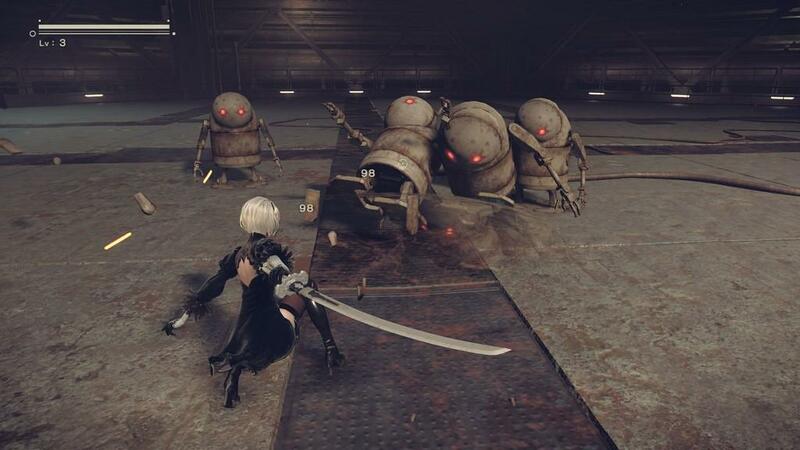 Instead of having a heavy attack, 9S can hack machines which will initiate a twin stick mini game. Hacking is incredibly fun and the difficulty of the hacking depends on how tough the machine is. This even unlocks the "arcade" option in the menu screen that lets you replay any of the hacking mini games you have finished before, or you can play a challenge mode to complete as many as possible before dying. On the second playthrough is also where the story starts to kick it into high gear as the twist and turns will start showing up and from that point on, it's a thrill ride of emotion to the final ending. As for the story itself, I unfortunately can't talk too much about it as I don't want to spoil anything for anyone. This is really one of those stories you need to experience on your own, but I will say that it's an incredibly deep and thought provoking story with hints of social commentary. What do you think would happen if machines in the future based their daily routines on how we as humans act today? Yeah, you get the picture. The story is also filled with tons of twist and turns and heartbreaking moments as well. The game is also perfectly paced and constantly drops little hints to keep you guessing about what is actually going on. It all leads up to a fantastic finale where even the by the final credits sequence, which is one of the most genius uses of a credits sequence I have ever seen, I was in tears. What adds to the is an incredible soundtrack that is both beautiful and haunting at the same time. The soundtrack will even change depending on what's going on in the story. After some of the biggest, more emotional moments hit, the song used in one area might be slowed down, and is a more melancholy version of the more upbeat song that was playing hours earlier. Nier: Automata was not just a videogame to me, it was an experience and one that I won't forget anytime soon. From the first stage to the final credits sequence, Nier: Automata is a non stop, action packed thrill ride that never lets up. The action is fast and fun, the story is incredibly engaging and the characters you meet along the way are fantastic. Even after 50 hours of playing, I still have side quests to complete, trophies to gather, various collectibles to find and the rest of the silly endings to complete. This is absolutely a game I will be replaying for many years to come. 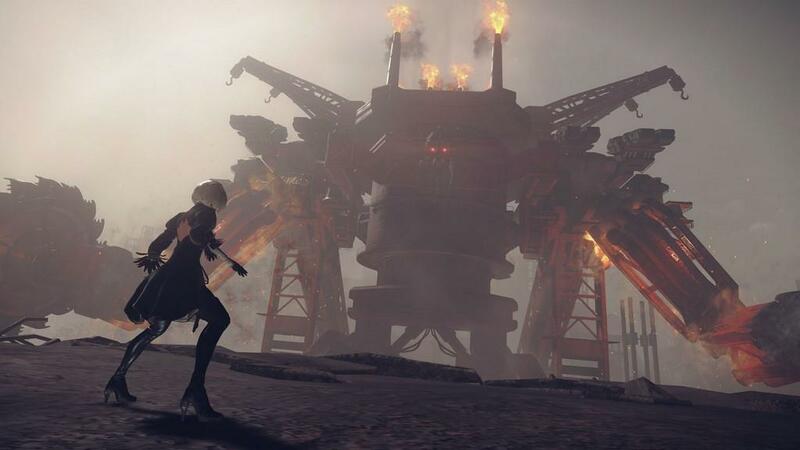 Nier: Automata the best game from Platinum Games yet. It's an action packed game that also has an incredibly engaging story and tons of fantastic characters. This is the best action game I have played in years and one of the best games I have ever played in my life. It's gonna take a lot to take my personal Game of the Year award from Nier: Automata as its currently sitting in the top spot.